NEW ORLEANS, LA — In commemoration of the city’s 300th anniversary in 2018, The Historic New Orleans Collection will provide a multifaceted exploration of the city’s first few decades and its earliest inhabitants with “New Orleans, the Founding Era,” an original exhibition and bilingual companion catalog. Opening Feb. 27, 2018, and sponsored by Whitney Bank, “New Orleans, the Founding Era” will bring together a vast array of rare artifacts from THNOC’s holdings and from institutions across Europe and North America to tell the stories of the city’s early days, when the settlement consisted of little more than hastily assembled huts and buildings. 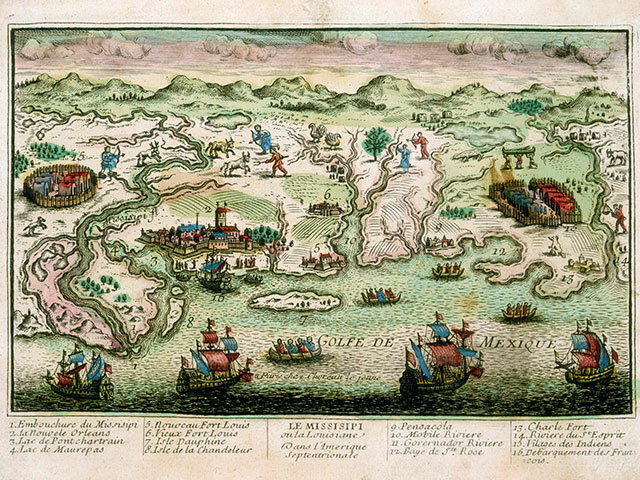 In 1718 the area proclaimed “La Nouvelle-Orléans” by Jean-Baptiste Le Moyne, sieur de Bienville, was an unwelcoming location for a new colony. The overgrowth was relentless, mosquitoes and other subtropical insects abounded and hurricanes regularly flattened attempts at creating structure from the chaos. Yet out of this harsh terrain, the city of New Orleans began to take shape, and over the course of the next few decades, every newly arrived group expanded and changed the city’s personality and landscape. Beginning with the region’s Native American tribes, through the waves of European arrival and the forced migration of enslaved African people, the exhibition will reflect on the complicated and often conflicted meanings that the colony’s development held for individuals, empires and indigenous nations. “The multiple personal, economic and organizational perspectives in ‘The Founding Era’ help visitors to realize that the complexity of living together as residents of a city has always been with us,” said John H. Lawrence, director of museum programs at THNOC. The display will feature works on paper, ethnographic and archaeological artifacts, scientific and religious instruments, paintings, maps and charts, manuscripts and rare books. These original objects will be complemented by large-scale reproductions and interactive items. More than 75 objects will be on loan from organizations in Spain, France, Canada and around the United States. A number of items, like a pair of 18th-century Native American bear-paw moccasins from the Musée du quai Branly in Paris and pieces of 15th-century Mississippian pottery from the University of Mississippi, have rarely traveled beyond their home institutions. “We hope that the power of seeing these amazing original items in the exhibition, whether paintings, documents, maps or three-dimensional objects, will give every visitor a sense of awe and inspiration that they are viewing things that are nearly as old as the city itself,” said Lawrence. Digital interactives will include a gallery of photographs from archaeological digs at a variety of French Quarter sites, a game quizzing visitors on supplies needed for a new home in the settlement and a 1731 inventory of enslaved Africans and African-descended people living on a West Bank plantation. In addition, the companion catalog-a bilingual edition, in both English and French-will feature essays describing the different populations who inhabited precolonial New Orleans and the surrounding areas, as well as the forces driving the settlement’s growth. Essayists include exhibition curator Erin M. Greenwald and historians Emily Clark, Shannon Lee Dawdy, Robbie Ethridge, Gilles-Antoine Langlois, Yevan Terrien, Daniel Usner and Cécile Vidal. Gérard Araud, ambassador of France to the United States, contributed the book’s foreword. The book has been made possible with support from the 2018 NOLA Foundation, Air Liquide, Alliance Française de la Nouvelle-Orléans, Council of French Societies in New Orleans, France-Louisiane Franco Américanie Association, Les Causeries du Lundi, L’Union Française, French American Chamber of Commerce-Gulf Coast Chapter, Consulate General of France in New Orleans, IBERIABANK, Dr. Phillip Mollère and E. Alexandra Stafford. “New Orleans, the Founding Era” will be on view at 533 Royal St. Feb. 27-May 27, 2018. The galleries will be open Tuesday-Saturday, 9:30 a.m.-4:30 p.m., and Sunday, 10:30 a.m.-4:30 p.m. Admission is free. About The Historic New Orleans Collection — Founded in 1966, The Historic New Orleans Collection is a museum, research center and publisher dedicated to the study and preservation of the history and culture of New Orleans and the Gulf South region. For more information, visit www.hnoc.org, call (504) 523-4662, or follow THNOC on Facebook, Instagram, and Twitter. As a publisher, THNOC produces award-winning original books exploring the history, art, music, culture, and decorative arts of the region. Our magazine, the Historic New Orleans Collection Quarterly, surveys the region’s history as it relates to THNOC’s projects and programs.